Posted on February 17, 2020 at 12:00 am. The evolutionary pressure on electronic structure software development is greatly increasing, due to the emergence of new paradigms, new kinds of users, new processes, and new tools. Electronic structure software complexity is consequently also increasing, requiring a larger effort on code maintenance. Developers of large electronic structure codes are trying to relieve some complexity by transitioning standardized algorithms into separate libraries [BigDFT-PSolver, ELPA, ELSI, LibXC, LibGridXC, etc.]. This paradigm shift requires library developers to have a hybrid developer profile where the scientific and computational skill set becomes equally important. These topics have been extensively and publicly discussed between developers of various projects including ABINIT, ASE, ATK, BigDFT, CASTEP, FHI-aims, GPAW, Octopus, Quantum Espresso, SIESTA, and SPR-KKR. High-quality standardized libraries are not only a highly challenging effort lying at the hands of the library developers, they also open possibilities for codes to take advantage of a standard way to access commonly used algorithms. Integration of these libraries, however, requires a significant initial effort that is often sacrificed for new developments that often not even reach the mainstream branch of the code. Additionally, there are multiple challenges in adopting new libraries which have their roots in a variety of issues: installation, data structures, physical units and parallelism – all of which are code-dependent. On the other hand, adoption of common libraries ensures the immediate propagation of improvements within the respective library’s field of research and ensures codes are up-to-date with much less effort [LibXC]. Indeed, well-established libraries can have a huge impact on multiple scientific communities at once [PETSc]. In the Electronic Structure community, two issues are emerging. Libraries are being developed [esl, esl-gitlab] but require an ongoing commitment from the community with respect to sharing the maintenance and development effort. Secondly, existing codes will benefit from libraries by adopting their use. Both issues are mainly governed by the exposure of the libraries and the availability of library core developers, which are typically researchers pressured by publication deliverables and fund-raising burdens. They are thus not able to commit a large fraction of their time to software development. – A common and consistent code development infrastructure/education in terms of compilation, installation, testing and documentation. – How to use and integrate already published libraries into existing projects. – Creating long-lasting synergies between developers to reach a “critical mass” of component contributors. – Relevant quality metrics (“TRLs” and “SRLs”), to provide businesses with useful information . This is what the Electronic Structure Library (ESL)[esl, esl-gitlab] has been doing since 2014, with a wiki, a data-exchange standard, refactoring code of global interest into integrated modules, and regularly organizing workshops, within a wider movement lead by the European eXtreme Data and Computing Initiative [exdci]. The evolutionary pressure on electronic structure software development is greatly increasing, due to the emergence of new paradigms, new kinds of users, new processes, and new tools. The large feature-full codes that were once developed within one field are now undergoing a heavy restructuring to reach much broader communities, including companies and non-scientific users. More and more use cases and workflows are performed by highly-automated frameworks instead of humans: high-throughput calculations and computational materials design, large data repositories, and multiscale/multi-paradigm modeling, for instance. At the same time, High-Performance Computing Centers are paving the way to exascale, with a cascade of effects on how to operate, from computer architectures to application design. The disruptive paradigm of quantum computing is also putting a big question mark on the relevance of all the ongoing efforts. All these trends are highly challenging for the electronic structure community. Computer architectures have become rapidly moving targets, forcing a global paradigm shift. As a result, long-ignored and well-established software good practices that were summarised in the Agile Manifesto nearly 20 years ago are now adopted at an accelerating pace by more and more software projects. With time, this kind of migration is becoming a question of survival, the key for a successful transformation being to allow and preserve an enhanced collaboration between the increasing number of disciplines involved. Significant efforts of integration from code developers are also necessary, since both hardware and software paradigms have to change at once. Two major issues are also coming from the community itself. Hybrid developer profiles, with people fluent both in computational and scientific matters, are still difficult to find and retain. On the long run, the numerous ongoing training initiatives will gradually improve the situation, while on the short run, the issue is becoming more salient and painful, because the context evolves faster than ever. Good practices have usually been the first element sacrificed in the “publish or perish” race. New features have usually been bound to the duration of a post-doc contract and been left undocumented and poorly tested, favoring the unsustainable “reinventing the wheel” syndrome. – socially, by disseminating the relevant knowledge and training the community, through the release of demonstrators and giving all stakeholders the opportunity to meet regularly. This is what the Electronic Structure Library (ESL) has been doing since 2014, with a wiki, a data-exchange standard, refactoring code of global interest into integrated modules, and regularly organising workshops, within a wider movement lead by the European eXtreme Data and Computing Initiative (EXDCI). Since 2014, the Electronic Structure Library has been steadily growing and developing to cover most fundamental tasks required by electronic structure codes. In February 2018 an extended software development workshop will be held at CECAM-HQ with the purpose of building demonstrator codes providing powerful, non-trivial examples of how the ESL libraries can be used. These demonstrators will also provide a platform to test the performance and usability of the libraries in an environment as close as possible to real-life situations. This marks a milestone and enables the next step in the ESL development: going from a collection of libraries with a clear set of features and stable interfaces to a bundle of highly efficient, scalable and integrated implementations of those libraries. Many libraries developed within the ESL perform low-level tasks or very specific steps of more complex algorithms and are not capable, by themselves, to reach exascale performances. Nevertheless, if they are to be used as efficient components of exascale codes, they must provide some level of parallelism and be as efficient as possible in a wide variety of architectures. During this workshop, we propose to perform advanced performance and scalability profiling of the ESL libraries. With that knowledge in hand it will be possible to select and implement the best strategies for parallelizing and optimizing the libraries. Assistance from HPC experts will be essential and is an unique opportunity to foster collaborations with other Centres of Excellence, like PoP (https://pop-coe.eu/) and MaX (http://www.max-centre.eu/). Based on the successful experience of the previous ESL workshops, we propose to divide the workshop in two parts. The first two days will be dedicated to initial discussions between the participants and other invited stakeholders, and to presentations on state-of-the art methodological and software developments, performance analysis and scalability of applications. The remainder of the workshop will consist in a 12 days coding effort by a smaller team of experienced developers. Both the discussion and software development will take advantage of the ESL infrastructure (wiki, gitlab, etc) that was set up during the previous ESL workshops. See http://pymatgen.org/ and http://www.aiida.net/ for example. Ab-initio simulation methods are the major tool to perform research in condensed matter physics, materials science, quantum and molecular chemistry. They can be classified in terms of their accuracy and efficiency, but typically more accurate means less efficient and vice-versa. The accuracy depends mainly on how accurate one can solve the electronic problem. The most accurate algorithms are the wave-function based methods, such as Full CI, Coupled Cluster (CC), and Quantum Monte Carlo (QMC) followed by the Density Functional Theory-(DFT)-based methods and finally more approximate methods such as Tight-Binding. Another impor- tant consideration is how the accuracy of a given method scales with the size of the system under consideration. Among the wave-function based methods, the accuracy of traditional quantum chemistry methods can be sys- tematically improved but their scaling with system size limits their applicability to small molecules. On the other hand, QMC methods have a much more tractable scaling and have, in spite of the “fermion sign problem” and the commonly used fixed-node approximation, because the energies are variational upper bounds, a way of systematically improving the accuracy. Recently there has been much progress in the use of pseudopotentials and the systematic improvement of nodal surfaces using backflow, and multiple determinants. [1, 2, 3] Conversely DFT based methods are based on a plethora of different self-consistent mean field approxima- tions, each one tuned to best represent a class of systems but with limited transferability. Despite progress in developing more general functionals [4, 5, 6], DFT is missing an “internal” accuracy scale; its accuracy is gen- erally established against more fundamental theories (like CC or QMC) or against experiments. DFT methods are very popular because their favorable scaling with system size, the same as for QMC, but with a smaller prefactor. In a number of recent applications [7, 8] it was found that inclusion of nuclear quantum effects (NQE) worsen considerably the agreement between DFT predictions and experiments. This is ascribed to the inac- curacies of DFT. This illustrates the importance of not using experimental data alone to improve the DFT functional but instead calculations using more fundamental methods. There has been a recent effort to establish the accuracy of DFT approximations by benchmarking with QMC calculations not only for equilibrium geome- tries but also for thermal configurations. This benchmarking can be customized for the individual molecules at a given temperature and pressure and geometry [9, 10, 11, 12]. • Benchmarking existing DFT functionals with QMC. DFT has the potential to be accurate, but the main problem with its predictive power is that its accuracy can be system dependent. QMC was instrumental in developing the first exchange-correlation approximations (e. g. LDA), and we envisage that it can play a substantial role to help the discovery and tuning of new functionals. In particular, the tuning of dispersion interactions appears to be a crucial elements still not fully controlled in modern DFT approximations while it plays a crucial role in many systems like hydrogen and hydrogen based materials such as water. • ML approaches with QMC accuracy. Machine Learning (ML) has attracted significant interest recently, mainly because of its potential to study real life systems, and also to explore the phase space at a scale that is not available to ab-initio methods. However, crucial for the ML method is the quality of the training set. It is often possible to train a ML potential on small systems, where accurate energies and forces can be obtained by quantum chemistry methods. However, training sets including larger systems are needed. QMC has the potential to provide them especially going forward with exascale computing. • opportunity for new exascale applications of QMC to impact simulation for larger systems and longer time scale. QMC is capable of exploiting parallelism very efficiently, and is probably one of the few methods already capable of running at the exascale level. ML methods on large data set are also inherently parallel and directly usable on exascale machines. • We will address the problem of using and testing the force field derived for a small systems to those of a much larger size. • We will discuss the use of ML methods to derive new classes of wave functions for QMC calculations of complex systems. J. Kolorenc and L. Mitas, Rep. Prog. Phys. 74, 1 (2010). L. K. Wagner and D. M. Ceperley, Rep. Prog. Phys. 79, 094501 (2016). M. Taddei, M. Ruggeri, S. Moroni, and M. Holzmann, Phys. Rev. B 91, 115106 (2015). J. Heyd, G. Scuseria, and M. Ernzerhof, The Journal of Chemical Physics 118, 8207 (2003). K. Lee, É. Murray, L. Kong, B. Lundqvist, and D. Langreth, Physical Review B 82, 81101 (2010). K. Berland et al., Reports on Progress in Physics 78, 66501 (2015). M. A. Morales, J. McMahon, C. Pierleoni, and D. M. Ceperley, Physical Review Letters 110, 65702 (2013). M. Rossi, G. P, and M. Ceriotti, Physical Review Letters 117, 115702 (2016). R. C. Clay et al., Physical Review B 89, 184106 (2014). M. A. Morales et al., Journal of Chemical Theory and Computation 10, 2355 (2014). R. C. Clay, M. Holzmann, D. M. Ceperley, and M. A. Morales, Physical Review B 93, 035121 (2016). M. J. Gillan, F. Manby, M. Towler, and D. Alfè, The Journal of Chemical Physics 136, 244105 (2012). K. V. J. Jose, N. Artrith, and J. Behler, Journal of Chemical Physics 136, 194111 (2012). J. Behler, The Journal of Chemical Physics 145, 170901 (2016). V. Botu, R. Batra, J. Chapman, and R. Ramprasad, The Journal of Physical Chemistry C 121, 511 (2016). J. C. Snyder, M. Rupp, K. Hansen, K.-R. Mu ̈ller, and K. Burke, Physical Review Letters 108, 253002 (2012). L. Li, T. E. Baker, S. R. White, and K. Burke, Phys. Rev. B 94, 245129 (2016). F. Brockherde et al., arXiv:1609.02815v3 (2017). Posted on April 24, 2018 at 11:49 am. Read our latest report on the state of the art codes and methods in Quantum Monte Carlo, Density Functional Theory (DFT) and beyond DFT methods. This report contains a review of the software available in these areas and on the basic features that the majority of these codes have in common with a view to modularisation. 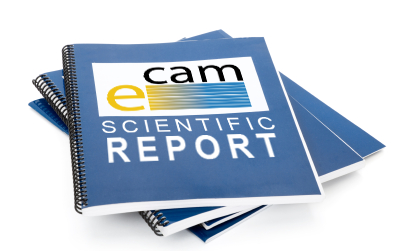 Based on that, a list of software development projects to be developed by E-CAM is discussed. Posted on March 16, 2018 at 11:33 am. The database of the force fields developed by the SNS SMART group (SNS, Pisa, Italy), including the metal-ions force fields optimized within E-CAM using novel Machine Learning procedure (reported in a recent publication and in a case study reported by E-CAM here), are now available for download at http://smart.sns.it/vmd_molecules/.